AmazonSmile Program Please help us while you shop! As you do your online shopping, I would ask that you click on this link (also below), save it as a favorite / bookmark to your browser and then use it as you shop on AMAZON. By shopping Amazon through this charity link, a percentage (.05%) of your online purchases will go back to the Summit Club as a donation. 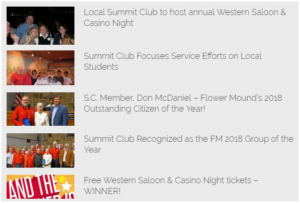 This is something really simple that we all can do (including your friends and family members) to help out the Summit Club. The more you spend via this link, the more the club gets back in return! You can find more details on the AmazonSmile Program, including how to select an organization to support at this link.